A hatchet-wielding Islamist steeped in Postmodern liberation ideology attacked a group of patrol officers in the New York City district of Queens, injuring two before the other officers shot and killed him. A bystander was wounded. Oct 23, 2014 Video credit: Devon McCarthy, owner of McCarthy's Books. A hatchet-wielding man attacked a group of patrol officers in a busy commercial district in Queens on Thursday, injuring two before the other officers shot and killed him. A bystander was wounded in the gunfire. The deceased suspect has been identified in multiple reports as 32-year-old Zale Thompson, an apparent Muslim who lived in Queens. Asked if the attack could be related to terrorism, Bratton didn’t rule it out. He cited the fatal shooting of a solider in Canada earlier this week – what officials there have called a terror attack – as reason for concern. 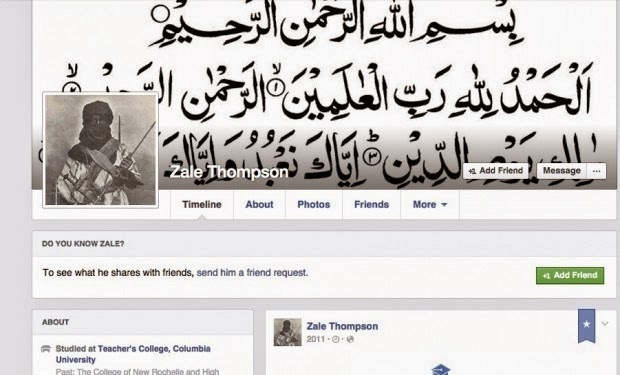 Screen shot of Zale Thompson Facebook page. The attack occurred in the commercial district in Queens at about 2 p.m., while four rookie New York Police Department officers on foot patrol were posing for a photo, police said. Without a word, the man charged the officers and began swinging the hatchet, first hitting one in the arm and another in the back of the head, they said. After the second officer fell to the ground, the two uninjured officers fired several rounds. The bullets killed the assailant and wounded the bystander, police said. The officer was in critical but stable condition and was expected to undergo surgery. The woman who was struck by a stray bullet also was hospitalized with a gunshot wound to the back. From the Mouth of Babes: "Islamic State is Right"